You had a great weekend and are about to leave home to start the week all over again. Parked at home you feel that your tools were safe. Moving to the back door of your van you notice the door is slightly open. To your surprise you have be hit. You are missing a lot of tools. This is repeated all over the US. Pickup trucks, vans and enclosed or open trailers are broken into on a regular basis. Now instead of going to your next job, you are heading to Lowes to replace $2000.00 worth of tools. Locked doors are easy for a un-protected vehicle. Easy to break glass or pry open a door. Without a security system you are at the mercy of luck. If you would like to take it to the next level then TRAILERWATCH 2 might interest you. Same features as our basic TRAILERWATCH but with a 2-Way Transmitter. Attached to your key chain. When TRAILERWATCH is triggered, a page is sent to your Key Fob Transmitter. Letting you know your vehicle has been broken into. Grab your gun and make tracks to your vehicle. Most thieves will leave the area when the siren goes off. They know that any minute someone is likely to run out the front door with a pissed off attitude. Get the idea. The TRAILERWATCH Portable Alarm system is a unique alarm system. Move it to where it is needed. With its self contained battery it is portable. 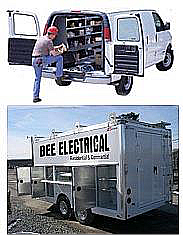 Protect your tools, construction trailer and parts while you sleep or work. Add a extra siren to your TRAILERWATCH. Built into each one is a set of connectors to hook additional siren. Here is where a TRAILERWATCH Alarm System can help. 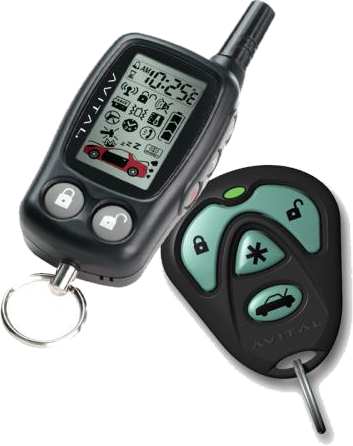 Place your TRAILERWATCH alarm inside the tool area of your van, pick-up box or trailer. Shut the door and arm TRAILERWATCH. The interior of your vehicle is now protected from intruders. If the door is open or the glass is broken the TRAILERWATCH will sound a 120db siren tone. This will warn-away most thieves. Any movement inside the trailer, van or pick-up box and TRAILERWATCH will detect this movement. How about this. You are working inside a house and are making trips back and forth to your work van. You can't leave the doors unlocked while you are working inside. Too many different people are moving on and off this site. How about turning on the TRAILERWATCH with the controller when you go back inside. If it is the TRAILERWATCHh 2 you will be notified if someone is pocking around your tools or parts.